I found this Dried Fruit and Nut Loaf recipe at the perfect time. I had just finished the last of my Christmas Fruit Cake and was looking for a similar type of cake to have with my coffee. This loaf fit the bill; a cake with lots of dried fruits (raisins, dried cranberries, dried cherries, dates, figs, prunes, and apricots) and nuts (walnuts, pecans, almonds, and/or hazelnuts) with just enough batter to hold it all together. What I also love about this cake is that it does not call for butter or even oil, instead, the ingredients are bound together with flour and beaten eggs. This recipe is adapted from Alice Medrich's cookbook Pure Desserts . It's an excellent recipe and the only change I made was instead of giving exact quantities of each dried fruit and nut, I just give the total amounts. That is, 3 cups (400 grams) of dried fruits and 3 cups (300 grams) of chopped nuts. That way you can vary the dried fruits and nuts to your individual tastes. There are a few things to keep in mind when buying dried fruits. First, try to buy in bulk from a grocery store or natural food store that has a high turnover. Not only will the fruit be fresher, but you can see, smell, and feel, the fruit to make sure it is fresh and of high quality. Pre-packaged fruit can also be excellent but it is harder to tell the quality of the fruit through the plastic bag. Make sure to check the expiration date on the bag. Always look for dried fruit that is plump, moist, and has good color. Never buy fruit that is dried out or moldy. There is a debate about whether to buy 'sulphured' or 'unsulphured' dried fruits. Some like to buy 'sulphured' which means that it has been treated with a sulphur dioxide solution. This preserves the fruit's bright color and makes the fruit very soft and moist. Of course, 'unsulphured' means it has not been treated before it is dried and some say the flavor of untreated dried fruits is far superior. 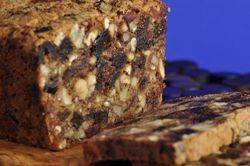 Dried Fruit and Nut Loaf: Preheat your oven to 300 degrees F (150 degrees C) and place the rack in the center of the oven. Butter, or spray with a vegetable oil spray, a 9 x 5 inch (23 x 12 cm) (8 cup) loaf pan, and line the bottom of the pan with parchment paper. In a large bowl, whisk together the flour, baking powder, baking soda, salt, and brown sugar. Stir in the chopped nuts and dried fruits. Use your fingers to make sure that all the fruits and nuts have been coated with the flour mixture. In the bowl of your electric stand mixer, fitted with the whisk attachment (or with an electric hand mixer) beat the eggs and vanilla extract until light colored and thick (this will take several minutes). Add the egg mixture to the fruit and nut mixture and mix until all the fruit and nut pieces are coated with the batter. Evenly spread into the prepared pan, pressing with the back of a spoon or offset spatula. Bake for about 65 to 80 minutes, or until the batter is golden brown and is just starting to pull away from the sides of the pan. (If you find the loaf over browning, cover with foil.) Remove from oven and place on a wire rack to cool completely in the pan. When cool, remove from pan. To store, cover with plastic wrap or foil. This loaf is best after being stored for a couple of days. Will keep for about 2 weeks at room temperature or for a couple of months in the refrigerator. It can also be frozen. Makes one - 9 x 5 inch (20 x 13 cm) loaf.